IBM Skills Academy is a collaboration of industry leaders working with educators and industry partners, to develop training relevant to sectors working with technology. Materials are updated regularly and adopted by academic institutions globally with upskilling add-ons that are industry-relevant. This further enhances graduates’ employability while preparing them for an all-rounded career. 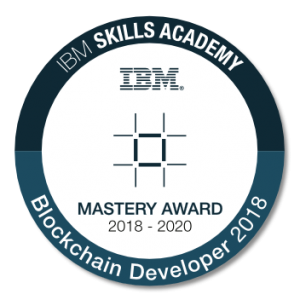 The IBM Skills Academy Programme is founded and prides itself on IBM’s long-standing tradition of collaborating with industry experts, researchers and leading academia including Stamford, MIT and Harvard Universities. What is IBM Skills Academy @ Kaplan? Kaplan in Singapore has partnered with IBM to provide the Skills Academy suite of courses. These courses challenge students to learn differently, apply new skills and encourage accelerated learning. Students will use sophisticated digital resources coupled with deep understanding from Kaplan’s various academic disciplines. The IBM Skills Academy initiative with Kaplan answers the workforce needs of today’s “Business with the Power of STEM” digital economy by transforming students into industry-focused professionals. This is done with face-to-face training in the application of latest infocomm technologies and tools. The training is paired with sophisticated interactive digital resources to provide an unparalleled blend of learning. It ensures industry-relevant training in areas of high demand such as the Information Technology industry. The application-focused courses also provide certifications that are recognised by the industry. Each course is a mix of classroom learning at Kaplan Professional’s campuses in the city centre and self-paced online learning. IBM Skills Academy @ Kaplan provides world-class training combining IBM’s official technical role-based courses, IBM-certified instructors, Kaplan’s deep technical and financial know-how, as well as hands-on laboratories that reflect actual application in the workplace. What can I receive upon completion? Upon completion of each course, students will receive a digital badge certifying their competence. The IBM Digital Badge is a cross-industry digital recognition of technical skills which can be shared on social and professional networking sites, even in your digital signature. Digital Badging is a recognition of skills and experience which you as an employee or employer can share anytime at any place. IBM’s Digital Badges are hosted and secured by a third party, and they recognise skills, knowledge and experience gained through training with IBM. The courses suit working adults and just about anyone keen to bridge their digital skills gap and stand out from the competition. Imagine if you could see all the places your food has travelled to and where all the ingredients came from just by taking a picture of the food label. With blockchain, there is greater visibility and efficiency in the entire supply chain across all industries. The Blockchain Developer course introduces learners to blockchain concepts such as business networks, participants, assets, and trusted transactions, using Hyperledger Fabric, Hyperledger Composer and IBM Blockchain Platform. This will require skills in areas such as shared ledger, smart contracts, consensus and architecture of blockchain solutions. CITREP+ supports local ICT professionals in keeping pace with technology shifts through continuous and proactive training. Through the training, they will acquire technical skills sets that will enable them to remain relevant and productive. 1Professionals category includes displaced workers. 2This has been harmonised with SkillsFuture initiatives. Note: CITREP+ funding does not support GST, VAT, registration fees, membership fees, rebates, renewal of certification, incentives, discounts or any training grant offered by any course providers or any other organisation in relation to the endorsed courses/certifications. For eligibility or claim procedures, please visit https://www.imda.gov.sg/CITREP for more information.